Do you have a love affair with Key lime pie - that sweet creamy dessert pie made from the juice of the tiny yellow-green key lime? It’s quite the specialty in Key West, and the “Official Pie of the State of Florida” thanks to the Florida Legislature. It’s sought after by everyone who visits, and doing your own self-guided tasting tour is one of the fun things to do in Key West especially for foodies (and add some extra pounds, but who's counting)! 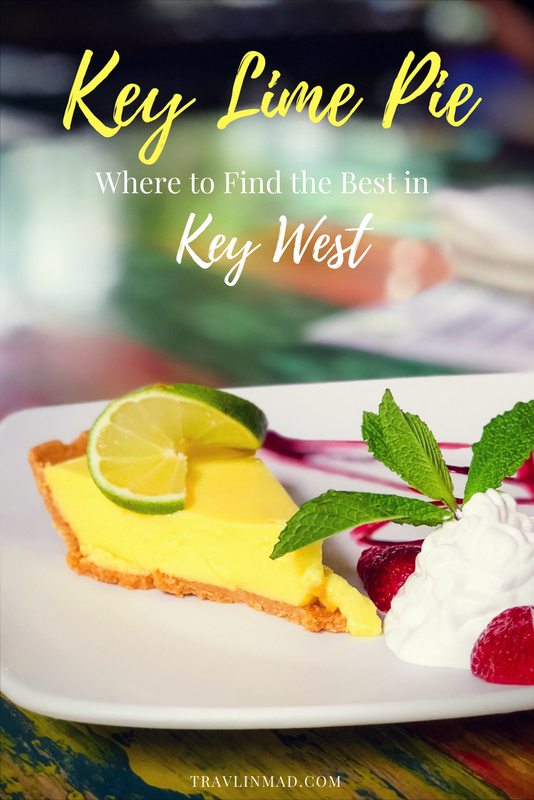 If you’ve never had Key Lime pie you might wonder what makes it so special — and what makes Key West one of the most unique food destinations in America — and to that question you’ll get more than one opinion. Purists will tell you there are three basic ingredients they all have in common: sweetened condensed milk, 100 percent key lime juice, and a good graham cracker crust. Key limes are smaller than the larger Persian limes traditionally sold in grocery stores, and the juice is more tart and aromatic. And although they're plentiful in south Florida, most of the ones you'll find in the US are grown in Mexico, and Central and South America. There are variations on the theme, of course. Some pies are baked and some are not, some prefer graham cracker crusts and some a pastry crust. But purists all agree on one thing...true Key lime pie is made with only 100 percent Key lime juice, not Persian limes and certainly not lime green Jello pudding mix. Your pie should always be yellow, never green. 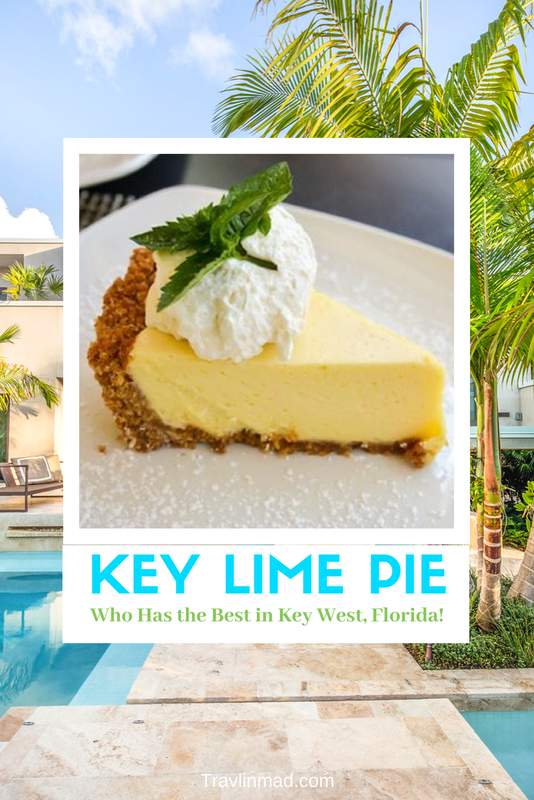 Just about every restaurant in Key West sells Key lime pie, so who has the best? Here's our countdown... and let the tasting begin! I have to admit, when this arrived at my table, I thought it might be too tart since the color was a bit on the neon yellow side. But the taste was amazing. And I loved the raspberry drizzle. A plaque out front announces it's the Birthplace of Key Lime Pie, 1856. I don't if that's true or not. All I know is the slice I had was so scrumptious, I never got around to taking a picture of it! Try a slice there or take home a whole pie. I'm not a huge fan of the mile-high meringue but the flavor in their Key lime pie is indeed heavenly. And the ambiance of Blue Heaven...well, it epitomizes Key West, especially at night. I can't believe I went so long before I tried the Key lime pie here, opting to fill up on their yummy bar food and island cocktails over the years. But their Key lime pie is a must now - creamy and delish! Caroline's Key lime pie was so good it deserved two pics! The pie texture and the crust was perfect. After Hurricane Irma, it was a welcome way to start our trip! The Key lime pie at Sarabeth's is uniform and bursting with key lime flavor, and we loved the unique almost meringue-y consistency. Their fluffy texture tones down the tartness that sometimes overpowers this simple dessert, and it works. To our palate, their Key lime pie is sublime and the perfect finish to a menu that’s consistently good. Pepe's hits all the right notes when it comes to Key lime pie: the right consistency and creamy texture, Goldilocks points (not too tart, not too sweet! ), the perfect amount of whipped cream......and it's served in a bowl. And Key lime pie served in a bowl is always a good idea! Who did we miss? Share your favorite and we'll check them out on our next trip to Key West!